A Rare Royal Worcester Porcelain Candlesnuffer Titled "Diffidence". 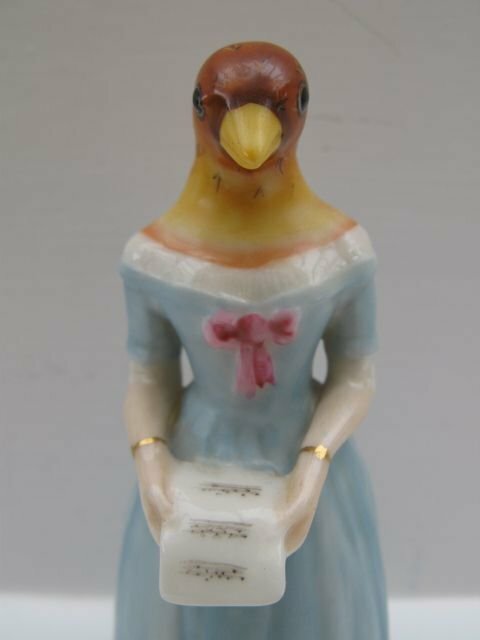 Standing approximately 4"tall x 1.3/4"wide, she has the puce factory stamp for 1923 and is in excellent condition with no damage, crazing or restoration, and the gilding is unworn. 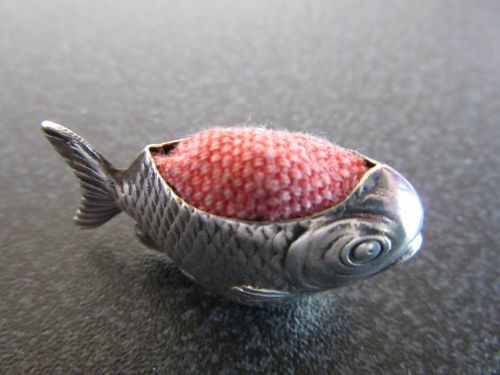 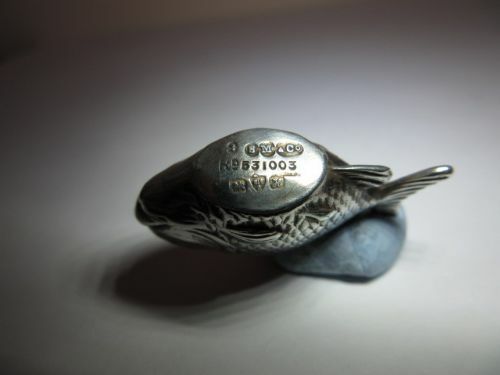 A Rare Silver Pin Cushion In The Form Of A Fish By SAMPSON MORDAN. 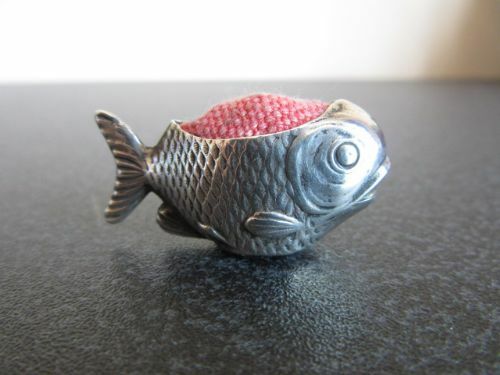 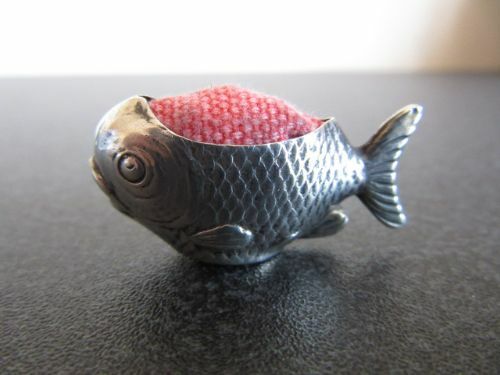 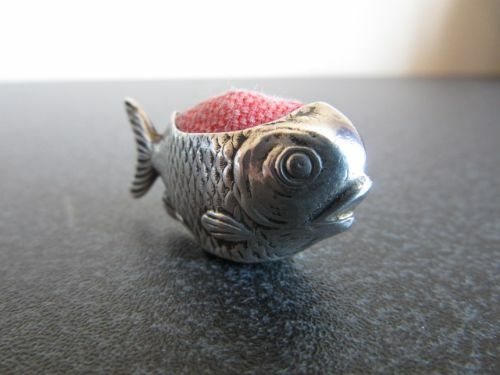 A small and rare, Edwardian solid silver pin cushion in the form of a fish. 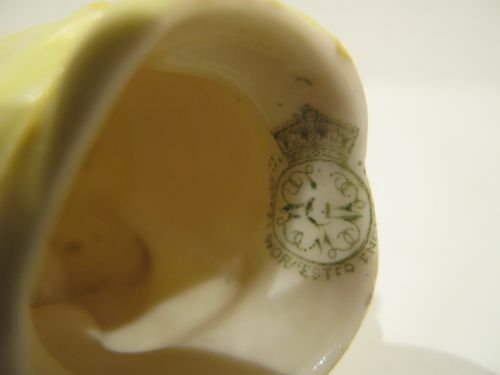 Measuring approximately 1.1/4"long x 5/8"tall x 1/2"wide, it has clear hallmarks for Chester 1908 by the highly regarded SAMPSON MORDAN and is in good condition with no damage or solder repairs, the gills and scales show light signs of rubbing and it has a replaced cushion. 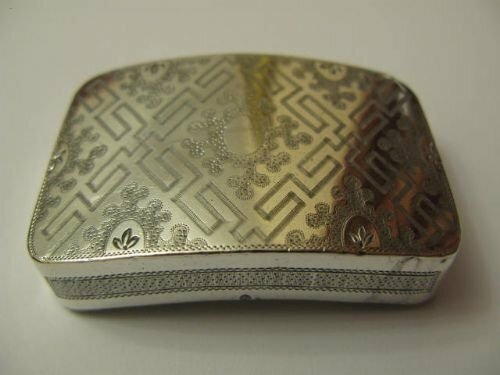 A Rare, George III Solid Silver Double Snuff Box. 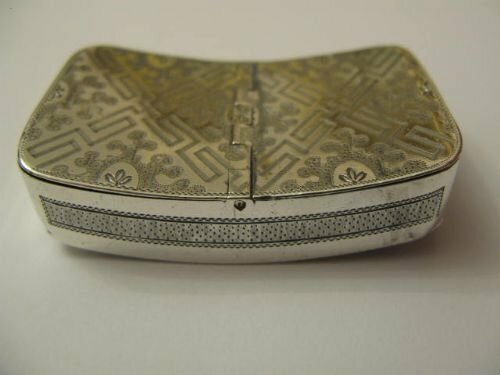 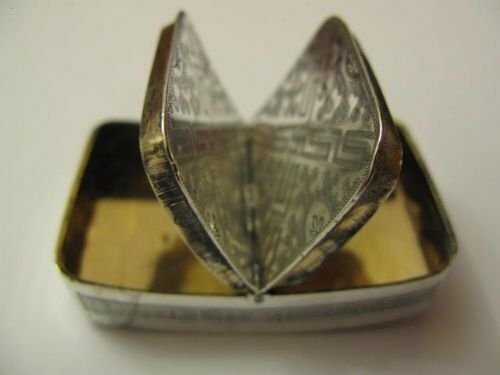 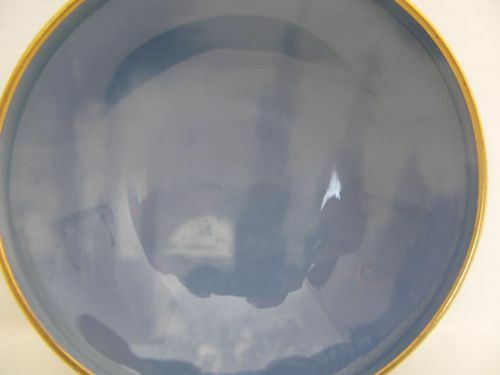 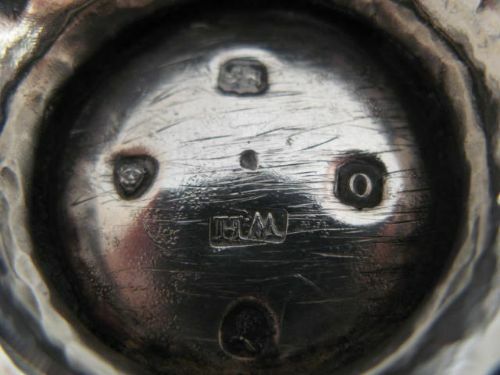 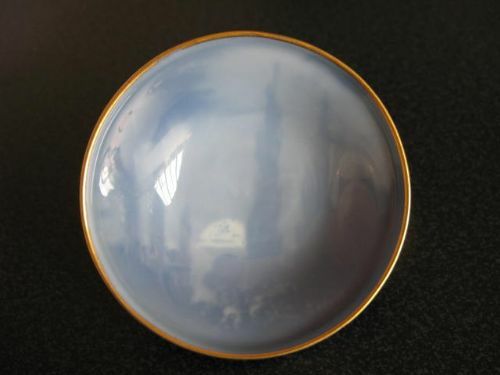 A good, George III solid silver double snuff box of curved form, with central internal division and both ends opening independently to allow for the carrying of two different formulations of snuff. Hallmarked for Birmingham 1806 by Joseph Willmore, it measures approximately 2.5" long x 1.5" wide x 0.5" deep and is in good condition with very little wear to the engraved decoration, both lids opening and closing firmly, no damage or repairs, and only the usual collection of slight dings and dents to the corners. A Regency, George IV Silver Teapot Hallmarked For London 1829. 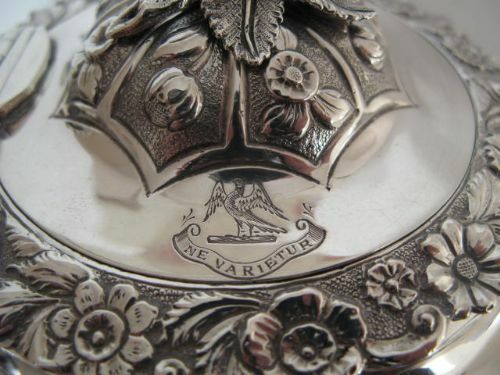 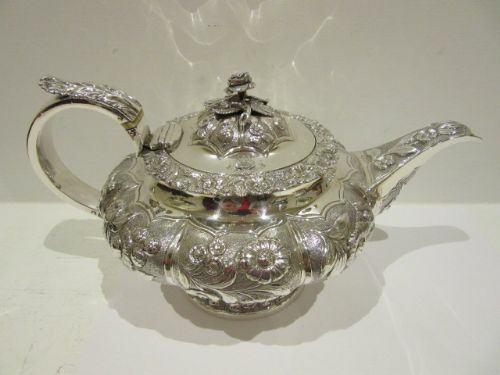 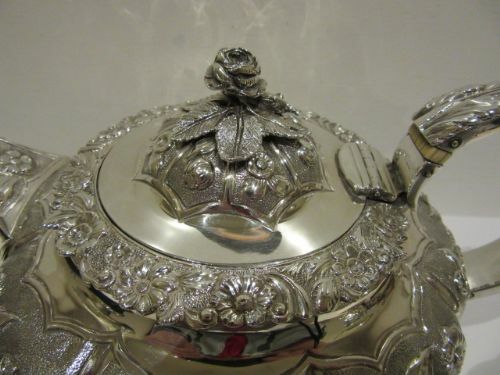 An excellent quality solid silver George IV teapot of attractive Regency form, with typical leaf capped handle, cast leaf and rose finial, ornately embossed body and complete with family crest. 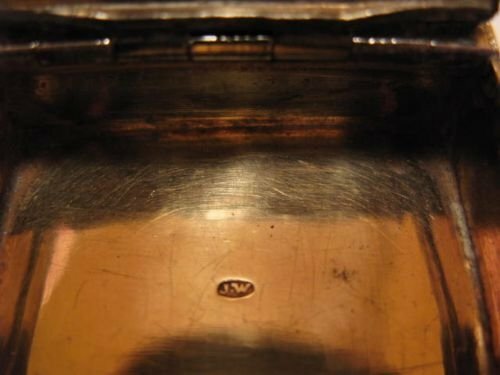 Measuring approximately 10.3/4"overall length x 7"diameter x 6"overall height, it is fully hallmarked under the footrim for London 1829 by "W.H" with corresponding partial marks to the lid, handle and the finial, and weighs a substantial 21troy ounces. 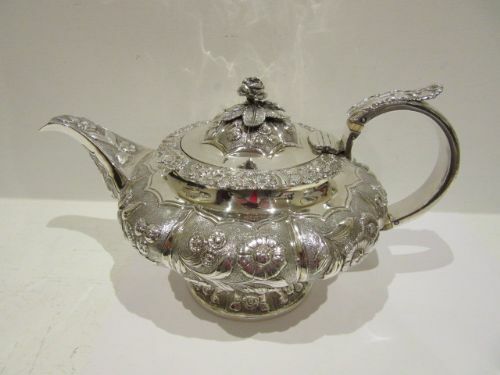 It is in lovely original condition with no splits, holes or repairs, the handle and lid are firm and without play and it has only a couple of small bruises underneath the waist which are barely noticeable even with the teapot turned upside down. 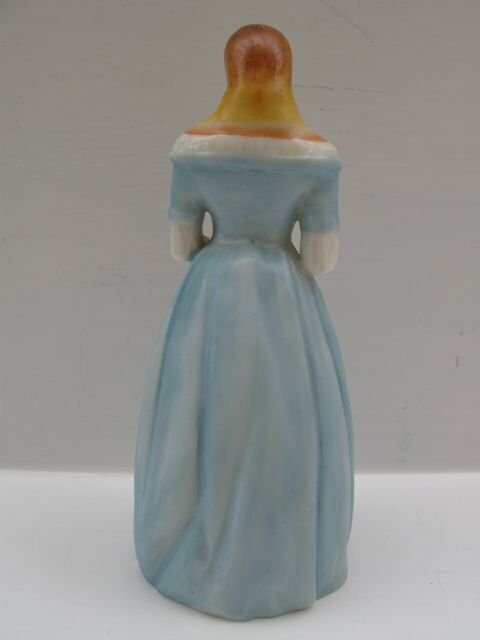 A Robinson & Leadbeater Tinted Parian Figure, Circa 1890. 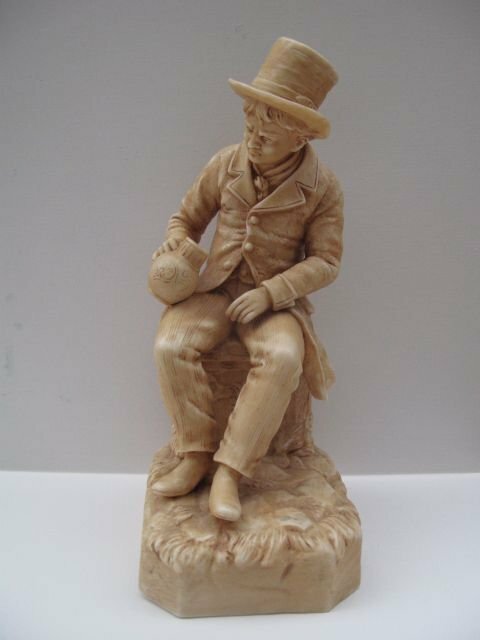 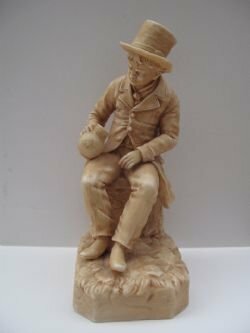 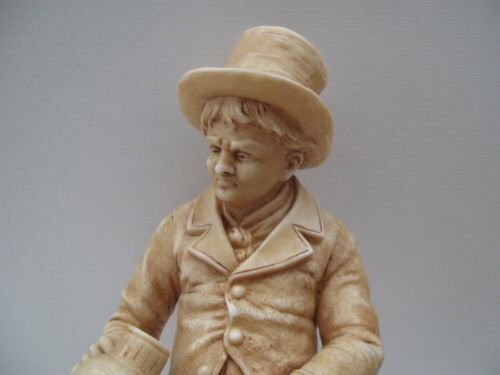 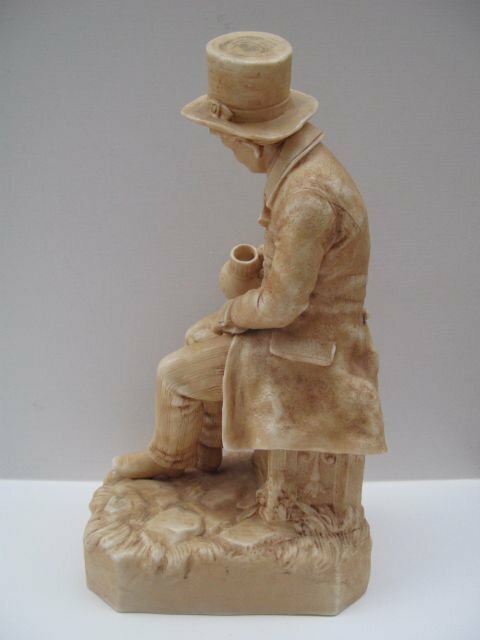 A well modelled, tinted parian figure of a man gazing ruefully into his empty beer jug! 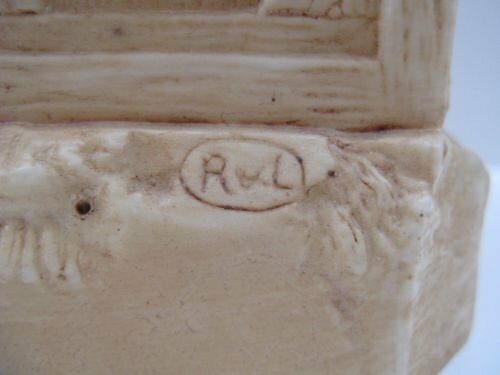 Dating to circa 1890, it is approximately 10"tall x 4.1/4"wide x 5.1/2"deep, with the inscrbed Robinson & Leadbeater trademark to the reverse, and is in excellent condition with no damage or restoration. 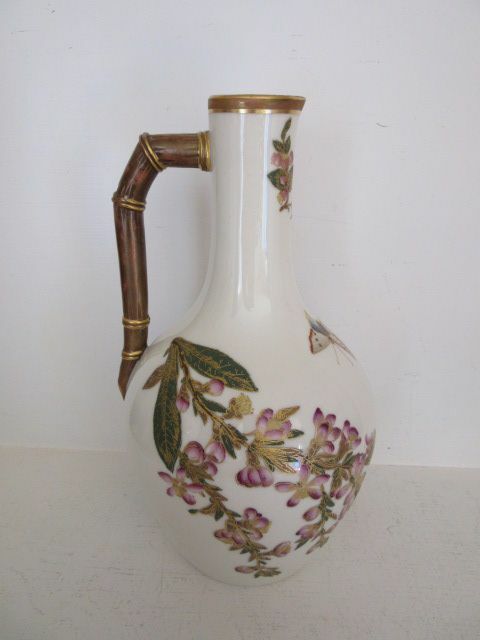 A Royal Worcester "Bamboo" Handled Pitcher. 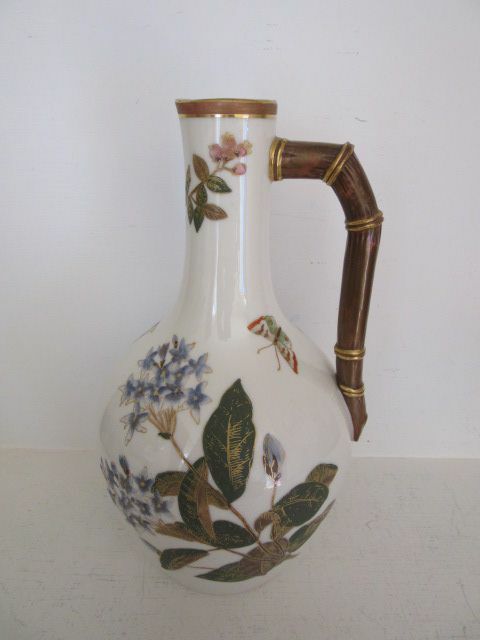 A Royal Worcester porcelain pitcher with simulated bamboo handle, and painted flower, gilt foliage and butterfly decoration. 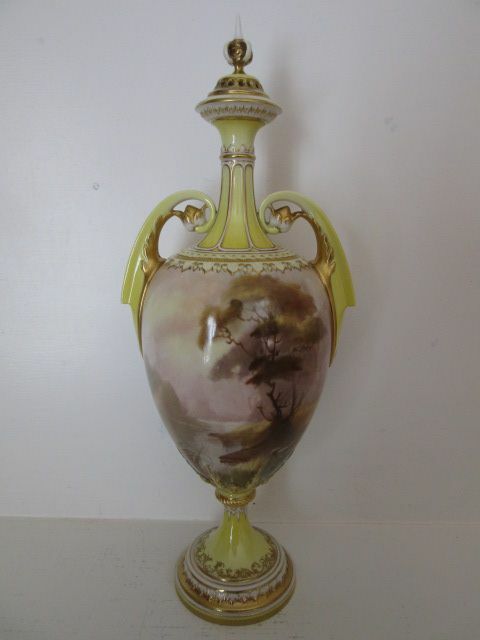 Standing approximately 10"overall height x 5.1/2"wide over the handle, it has the dark green factory stamp for 1884 and is in very good condition with no damage, crazing or restoration and the gilding showing only light wear on the foliage. 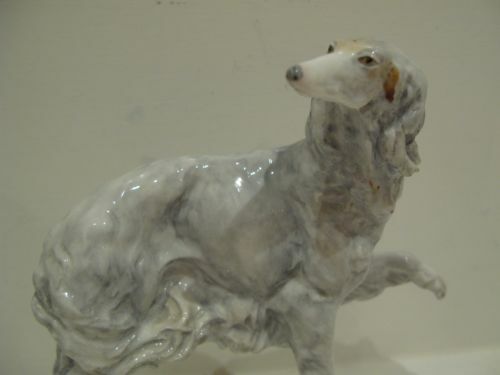 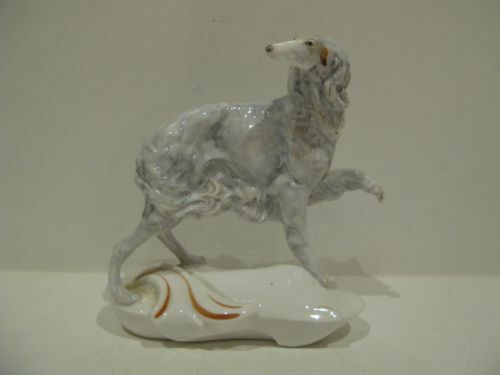 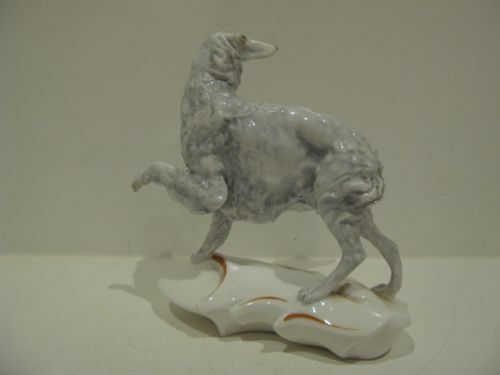 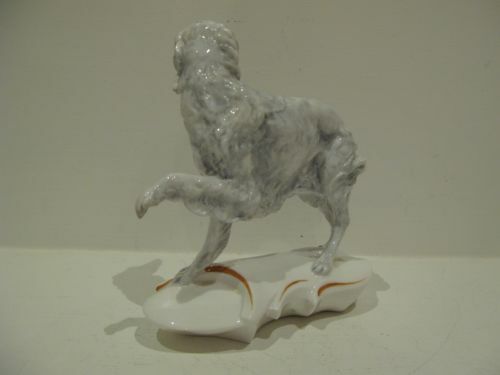 A Royal Worcester "Borzoi" Figurine By K. Potts. An attractive and well modelled Royal Worcester porcelain figurine titled "Borzoi" by Kenneth Potts. 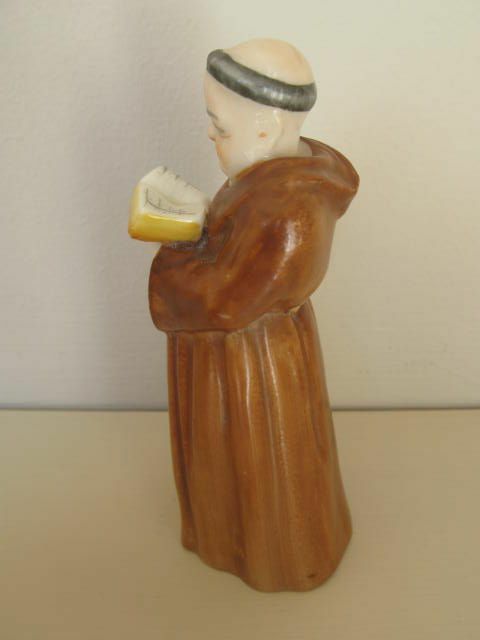 Standing approximately 5.3/4"tall x 5.3/4"wide, it has the black factory stamp for circa 1980 and is in excellent condition with no damage, crazing or restoration and the painting is bright and without wear. 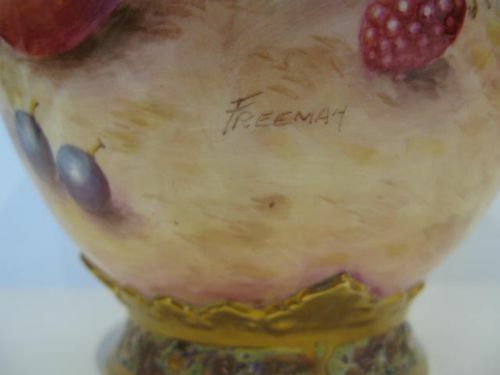 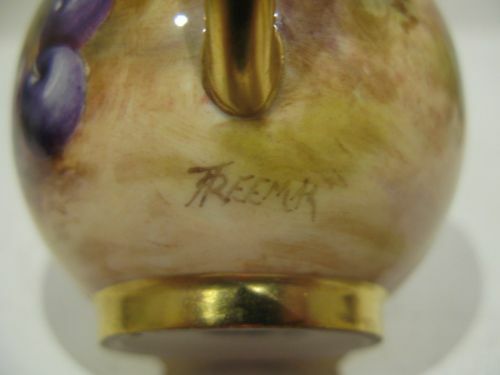 A Royal Worcester "Crown Top" Fruit Painted Pot Pourri By Freeman. A very impressive Royal Worcester "Crown Top" porcelain vase, shape number 2048 medium size, complete with both inner and outer lids and decorated with well painted all-around fruit decoration by John Freeman. 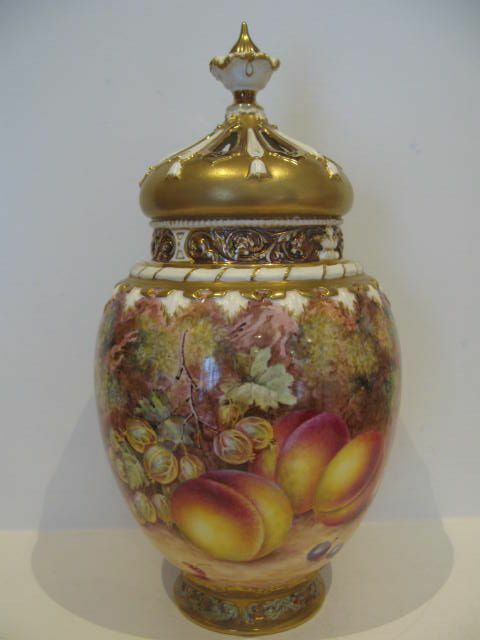 Measuring approximately 13.1/4"overall height x 7"diameter, it has the black factory stamp for circa 1970 and is in excellent condition with no damage, crazing or restoration, and the gilding is bright and without wear. 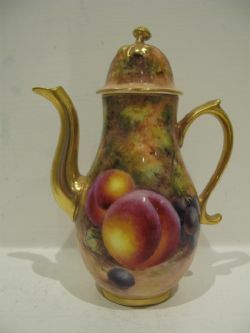 A Royal Worcester "Fruit" Miniature Coffee Pot By Freeman. 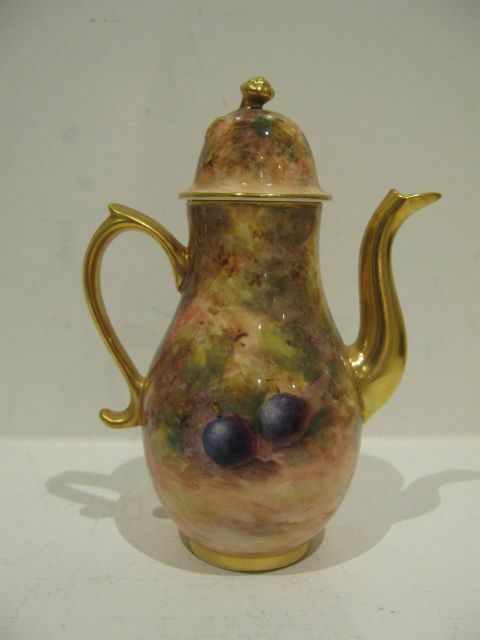 A good, Royal Worcester porcelain miniature coffee pot and cover, with well painted fruit decoration by John Freeman. Measuring approximately 5"overall height x 3.1/2"width over the spout and handle, it has the black factory stamp for 1951 and is in excellent condition with no damage, crazing or restoration and the gilding is virtually without wear. 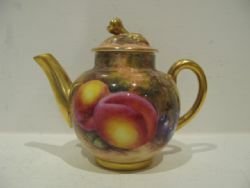 A Royal Worcester "Fruit" Miniature Teapot And Cover. A good Royal Worcester porcelain miniature teapot and cover, with well painted fruit decoration by John Freeman. 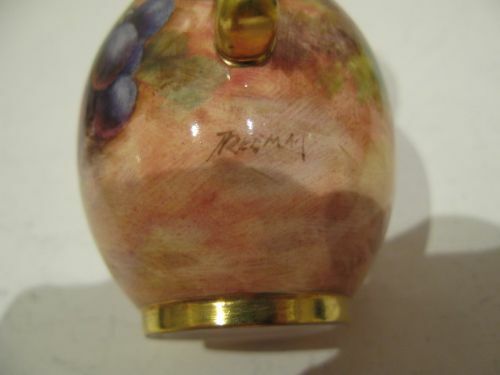 Measuring approximately 3.1/4"tall x 4"wide over the spout and handle, it has the black factory stamp for 1951 and is in excellent condition with no damage crazing or restoration, and the gilding is virtually without wear. 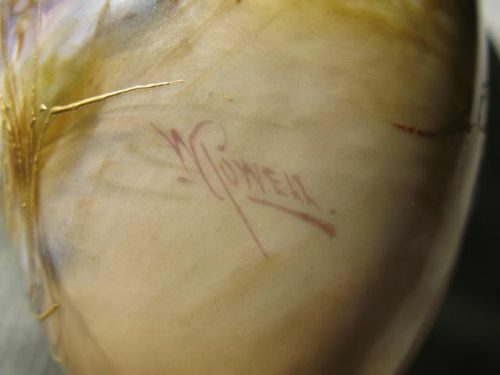 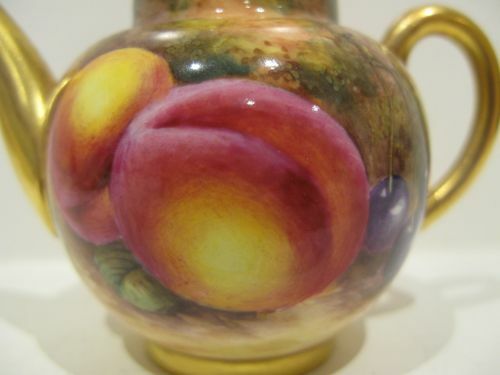 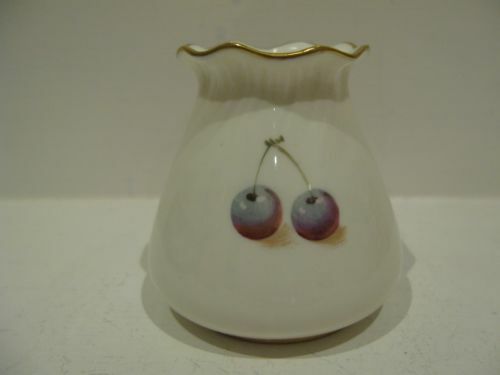 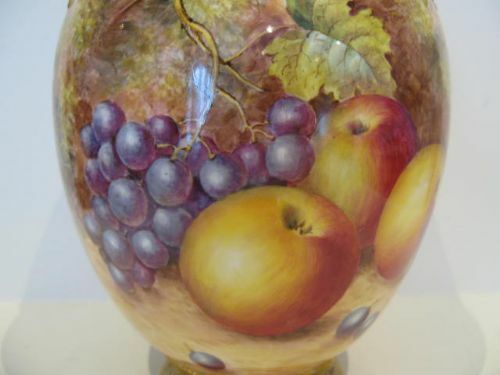 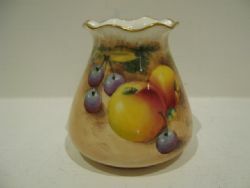 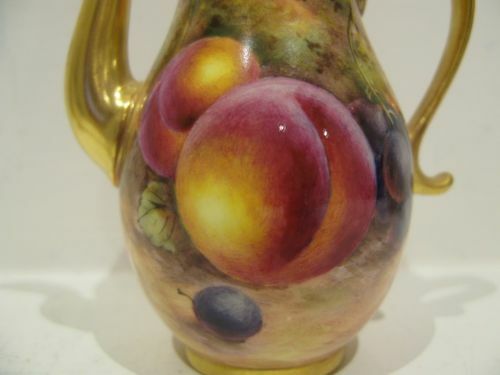 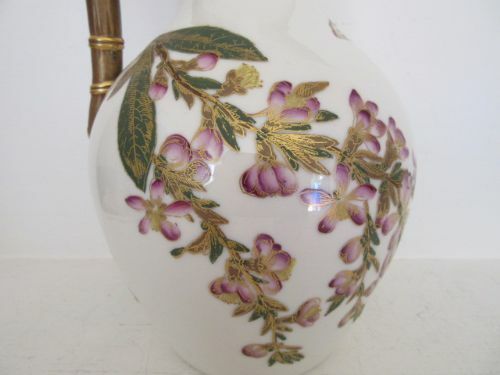 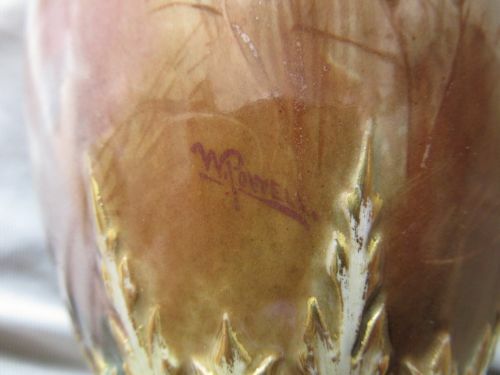 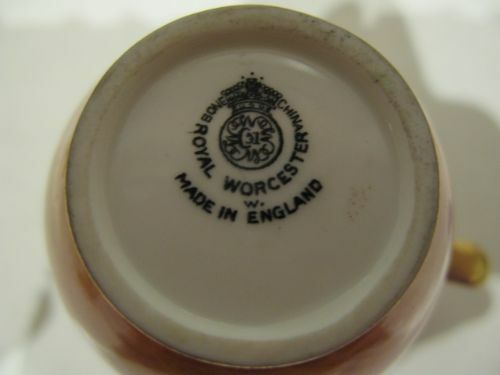 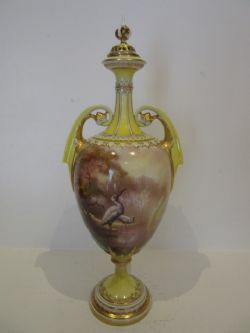 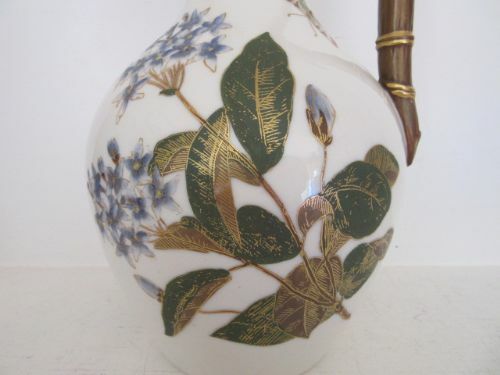 A Royal Worcester "Fruit" Vase By Roberts. 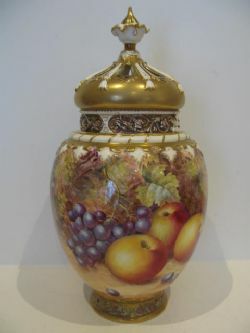 A Royal Worcester porcelain vase, shape number G957, with well painted fruit decoration by William Roberts. 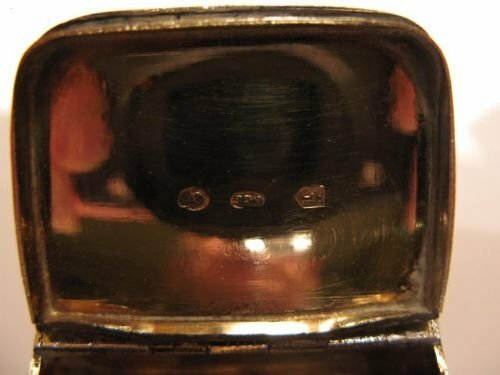 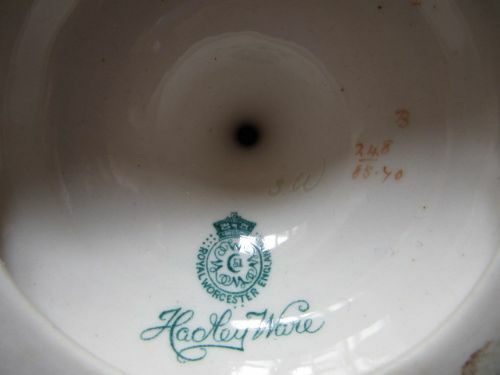 Measuring approximately 3.1/4"tall x 3.1/4"maximum diameter, it has the black factory stamp for circa 1970 and is in excellent condition with no damage, crazing or restoration and the gilding is virtually without wear. 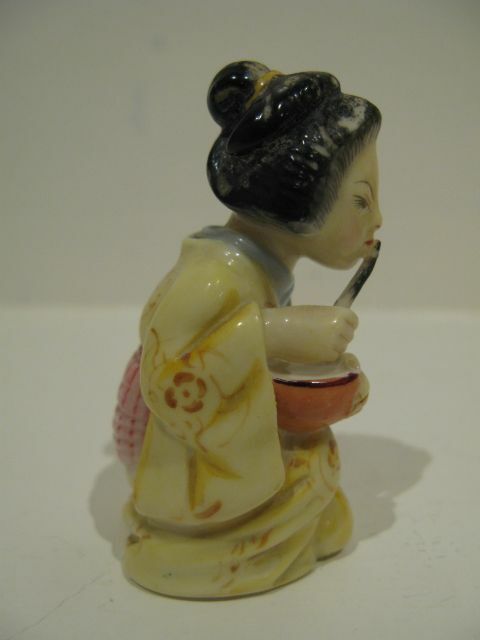 A Royal Worcester "Geisha" Candle Snuffer C1901. 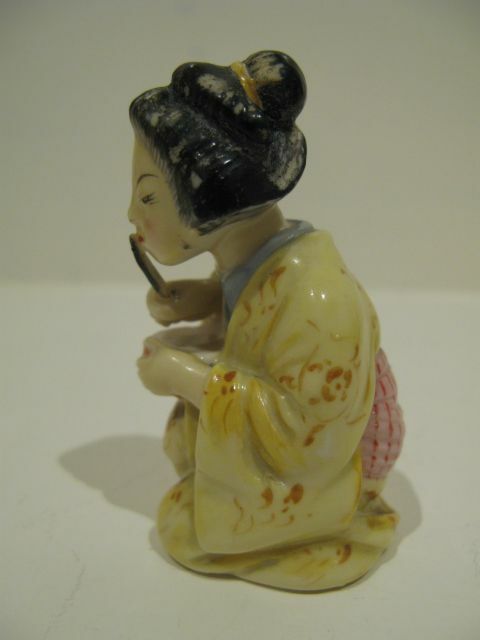 A rare, early Royal Worcester porcelain candle snuffer in the form of a Japanese Geisha with very well painted decoration and colours. 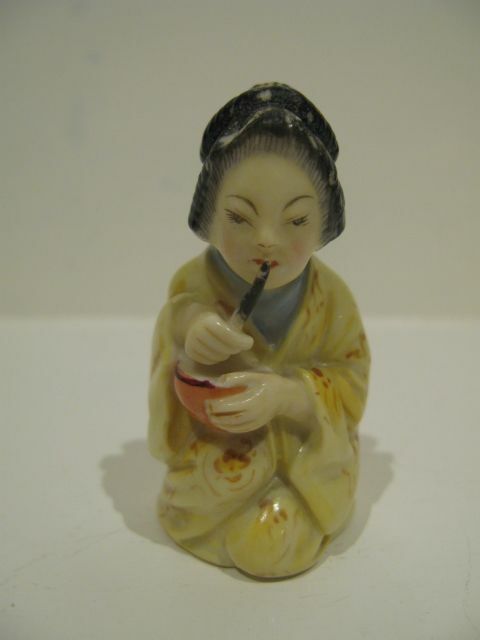 Measuring approximately 2.7/8"tall x 1.1/2"wide and with the dark green factory stamp for circa 1901, she is in very good condition with no damage, crazing or restoration and the colours are bright and vibrant with only some loss of the black of her hair. 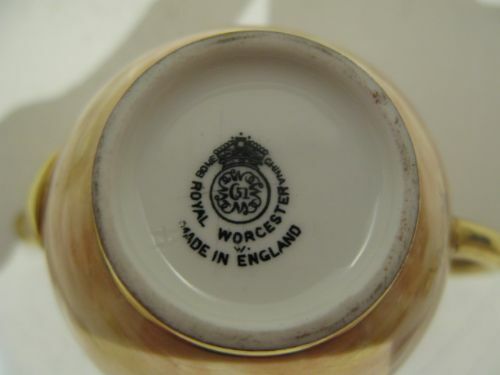 A Royal Worcester "Hadley Ware", Two Handled Vase And Cover By W Powell. 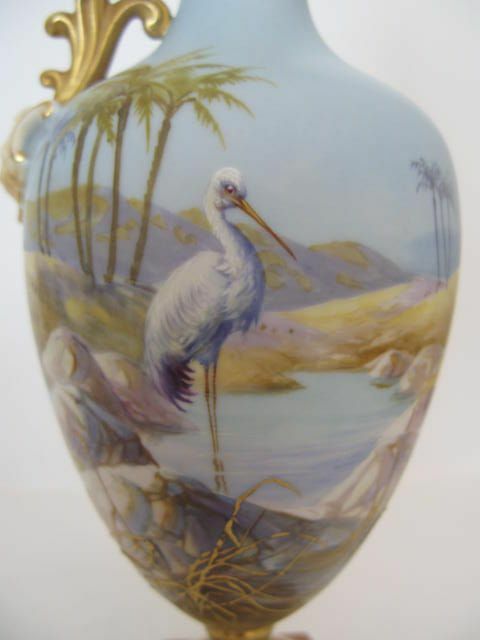 A very attractive, Royal Worcester porcelain "Hadley Ware" twin handled vase and cover on raised circular foot, shape number 248B, decorated with a lovely depiction of wading storks in a wooded riverside setting by the specialist artist, Walter Powell. Of impressive size, standing approximately 13"tall x 5" maximum width over the handles and having the dark green factory stamp for 1905, it is in very good condition with no damage, crazing or restoration and the gilding shows only the slightest signs of wear. 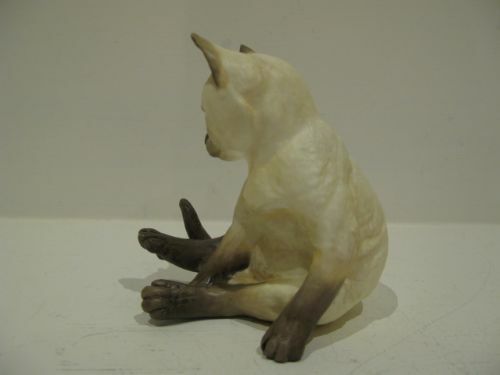 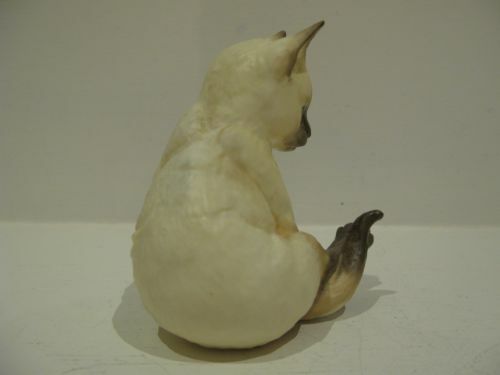 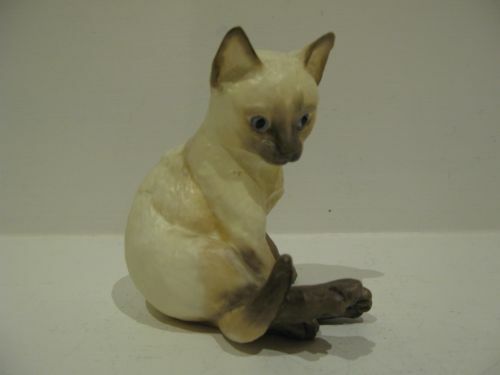 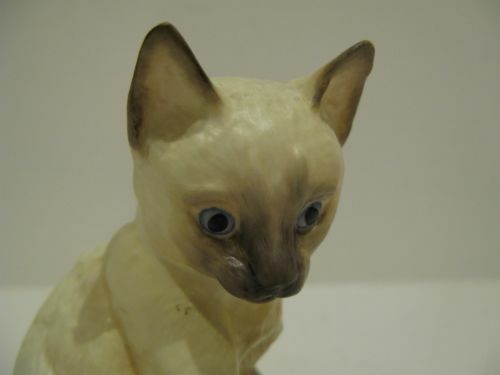 A Royal Worcester "Kittens Siamese" Figurine By J. Alder. 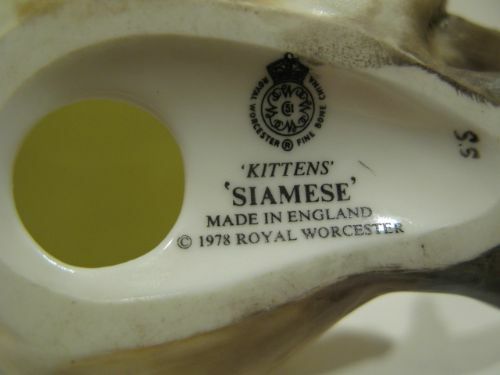 An appealing, Royal Worcester porcelain "Kittens, Siamese" well modelled figurine by James Alder. 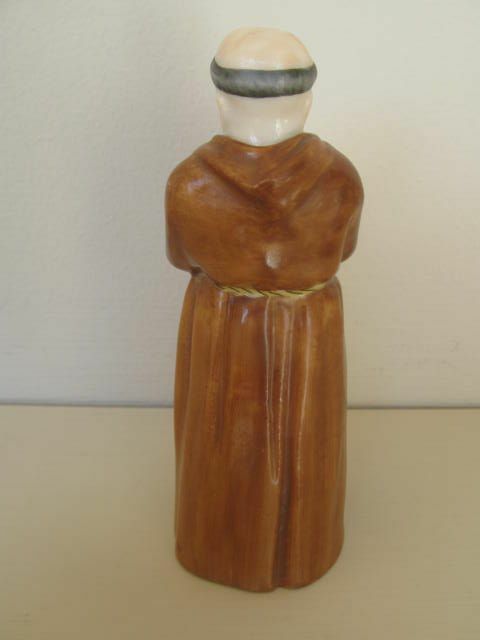 Standing approximately 4.1/4"tall x 3.3/4"wide, it has the black factory stamp for circa 1980 and is in excellent condition with no damage, chips or restoration and the painting is without wear. 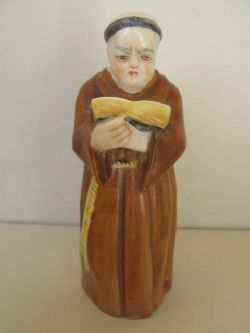 A Royal Worcester "Monk" Candlesnuffer. 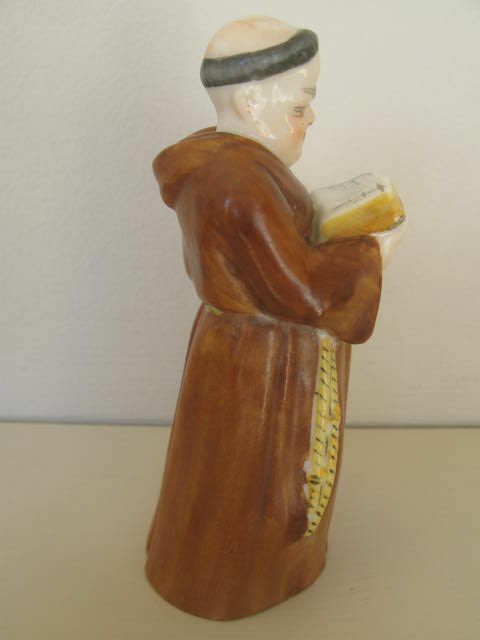 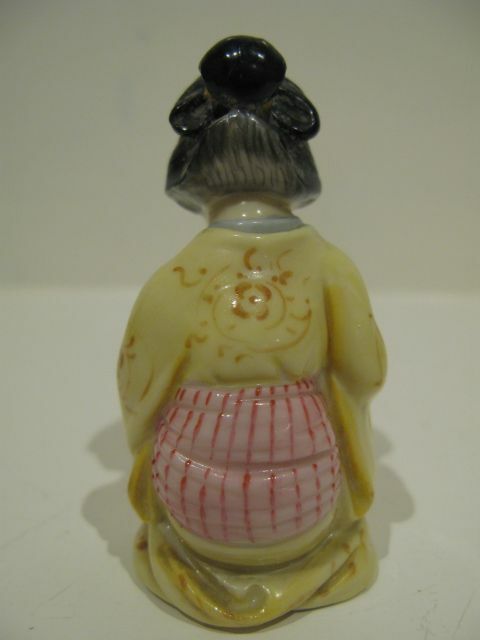 A Royal Worcester porcelain candlesnuffer in the form of a monk. 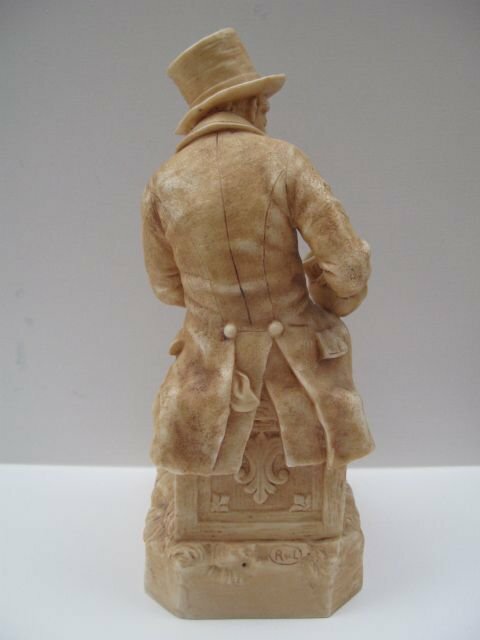 Standing approximately 4.7/8""tall x 1.3/4"wide and with the puce factory stamp for 1911, it is in very good condition with no damage, scratches, crazing or restoration. 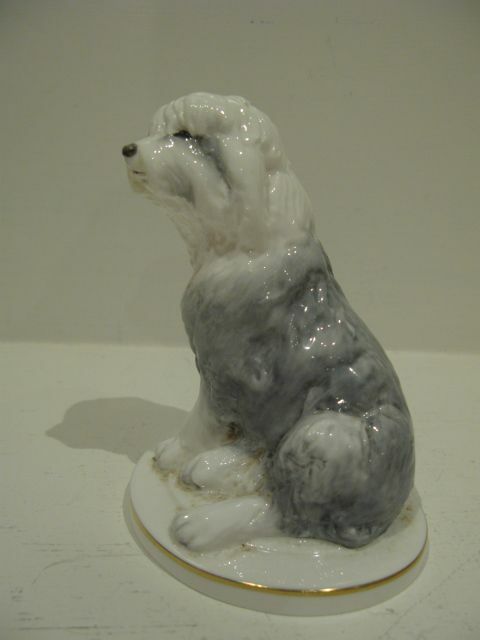 A Royal Worcester "Old English Puppy" Figurine by K. Potts. 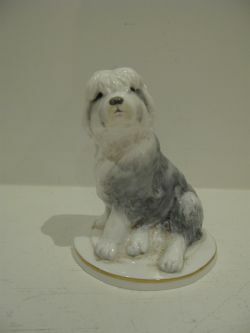 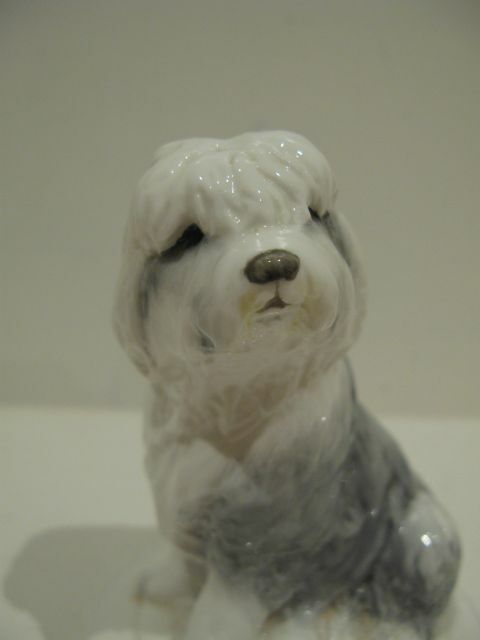 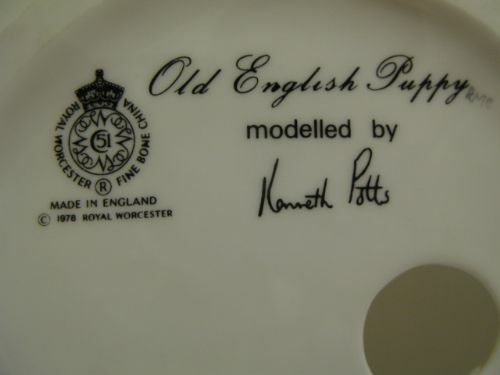 A Royal Worcester porcelain figurine titled "Old English Puppy", modelled by Kenneth Potts. 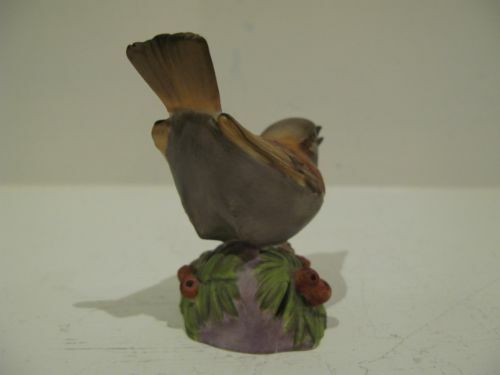 Standing approximately 5"tall x 4"wide with the black factory stamp for circa 1980, it is in excellent condition with no damage, chips or restoration with the paintwork and gilding still bright and without wear. 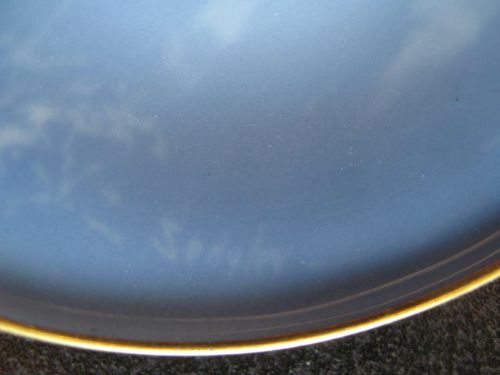 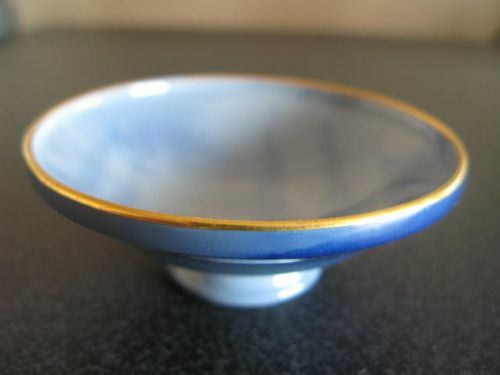 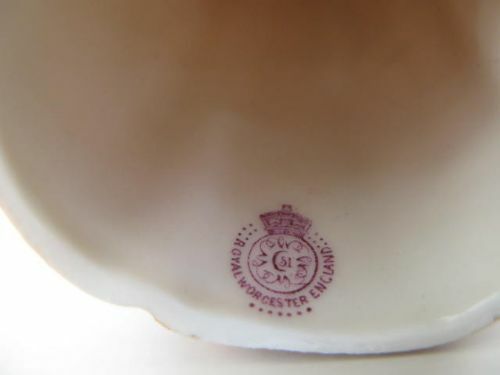 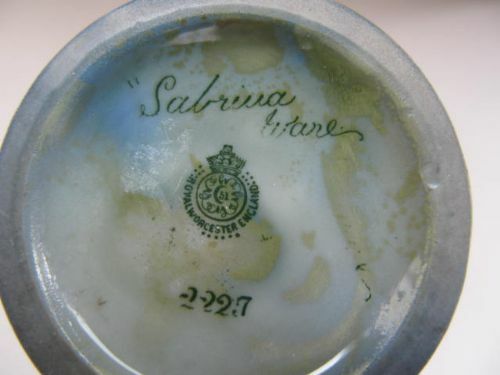 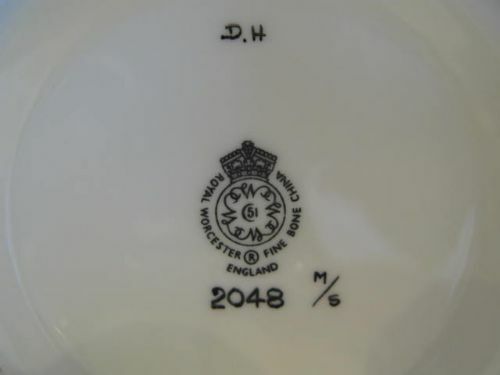 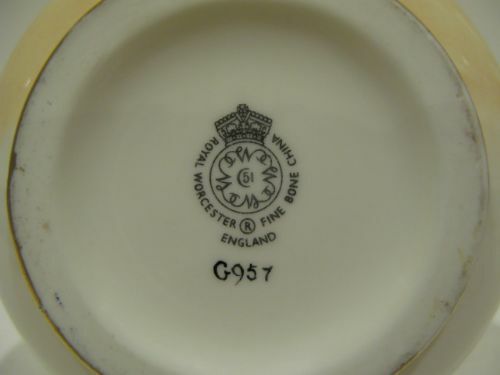 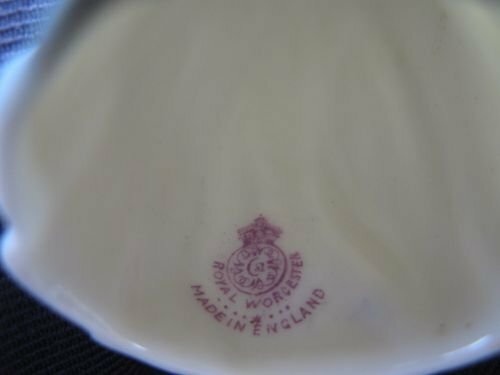 A Royal Worcester "Sabrina Ware" Dish By W. Sedgley. 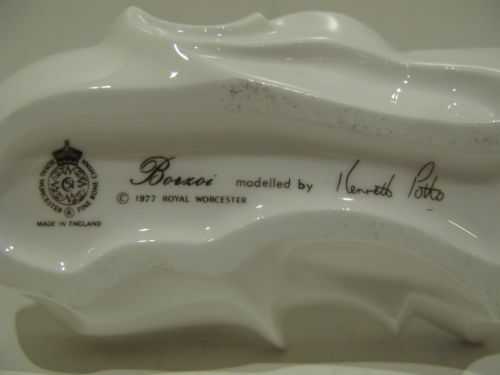 A small Royal Worcester "Sabrina Ware" footed dish, with a painted moonlit Italian garden scene by Walter Sedgley. 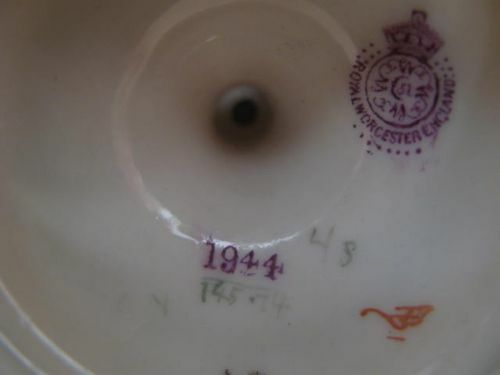 Measuring approximately 3.1/4"diameter x 1.1/4"tall, it has the factory stamp for 1926 and is in very good condition with no damage, crazing or restoration and the gilding shows virtually no wear. 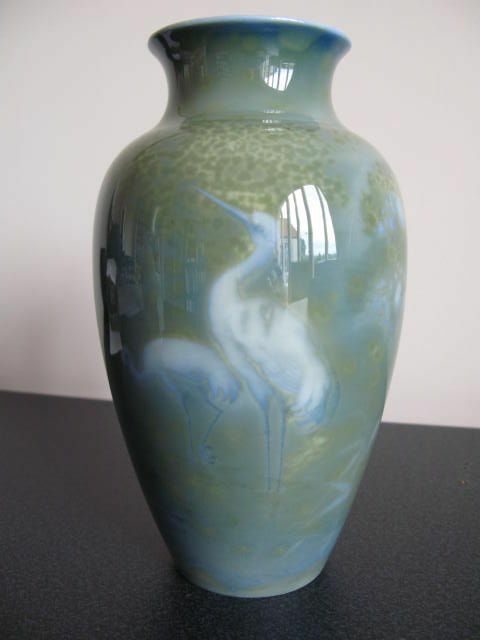 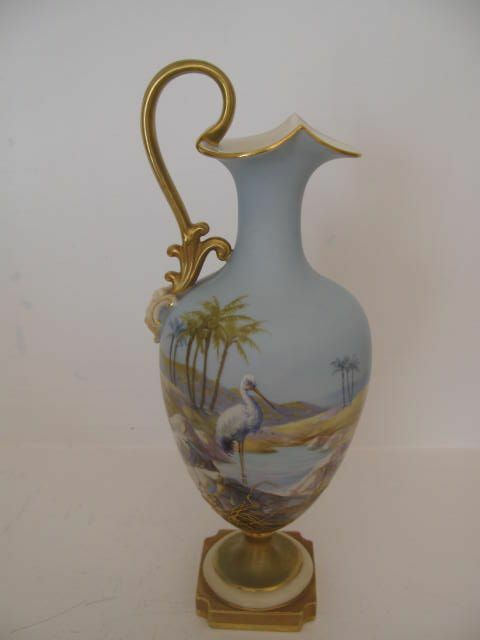 A Royal Worcester "Sabrina Ware" Stork Painted Vase By A. Shuck. 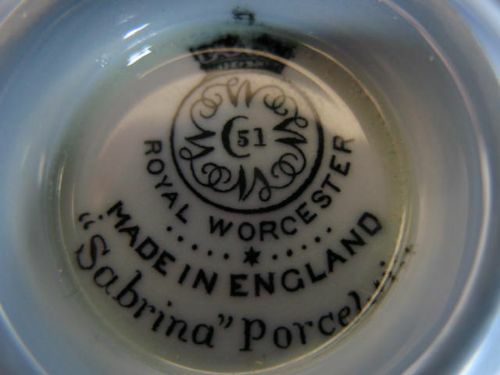 Firstly, apologies for the variable quality of these images, but I've found Sabrina Ware almost impossible to photograph accurately! 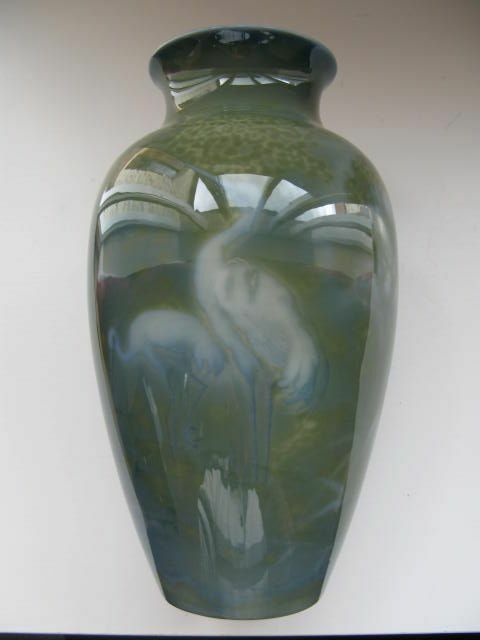 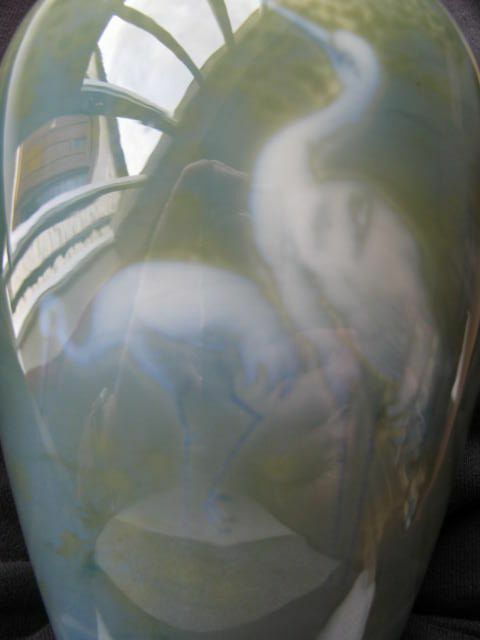 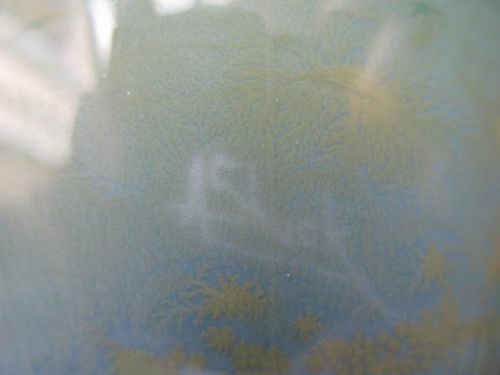 If it is of any help, the colour is closest in picture 1 and the fuzzy images of the storks are as they appear on the vase. 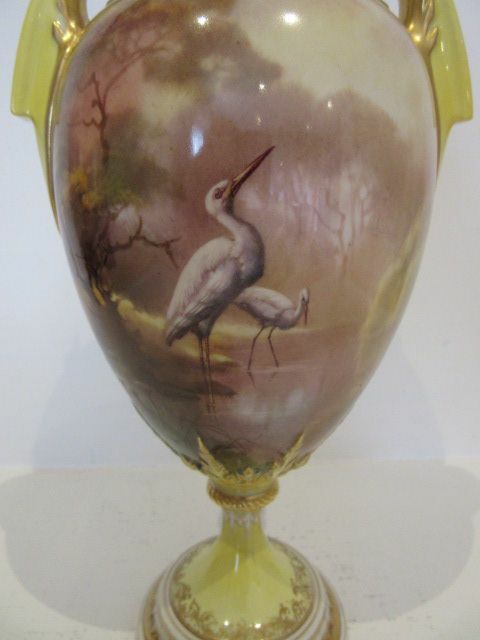 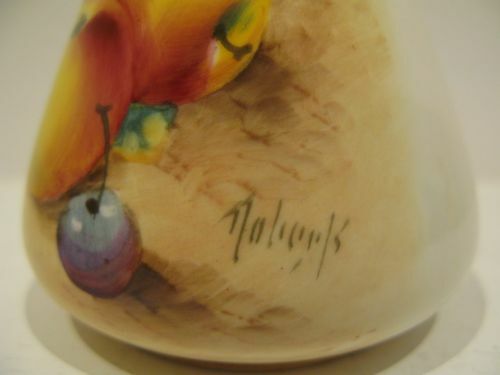 A Royal Worcester "Sabrina Ware" vase, shape number 2227, with painted decoration of two wading storks by Albert Shuck. 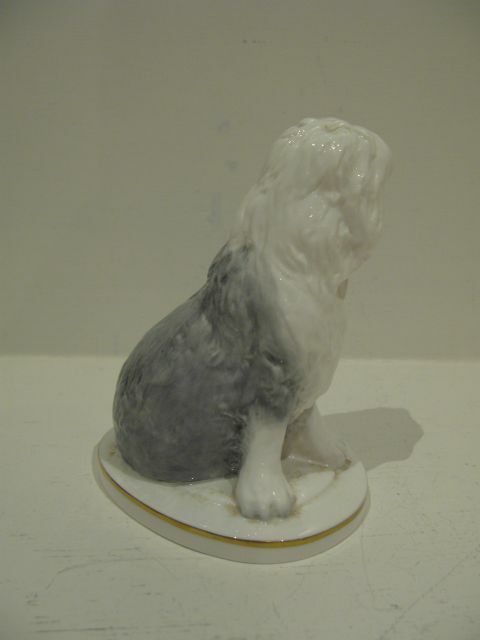 Standing approximately 7.3/8"tall x 4.1/4"diameter, it has the factory stamp for 1909 and is in excellent condition with no damage, scratches, crazing or restoration. 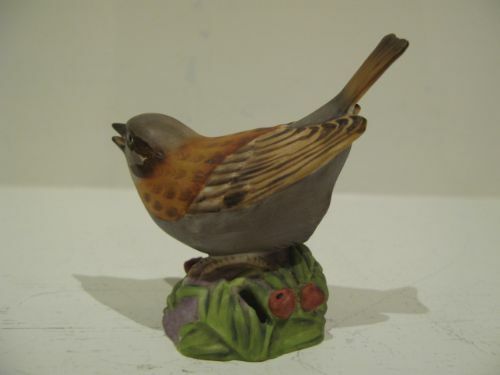 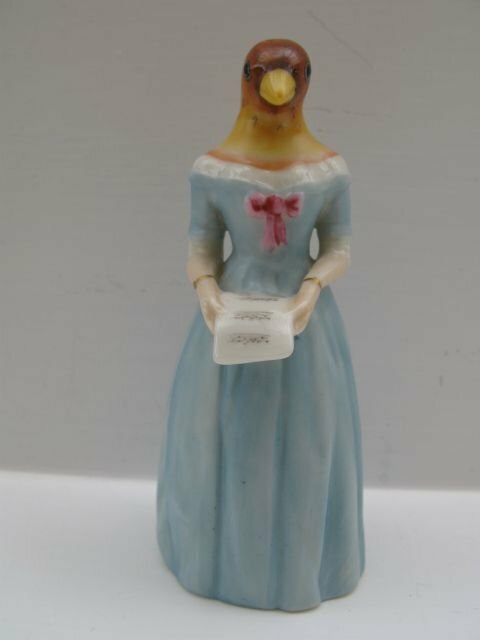 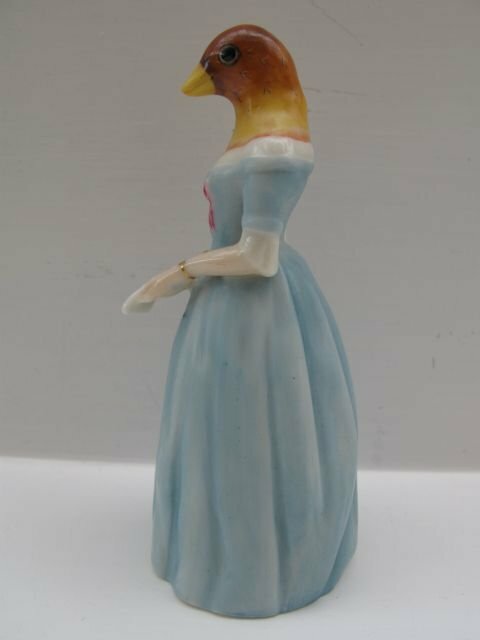 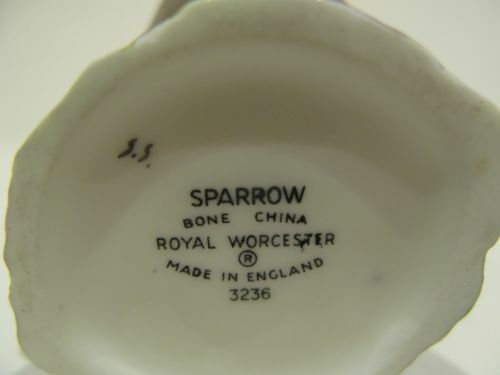 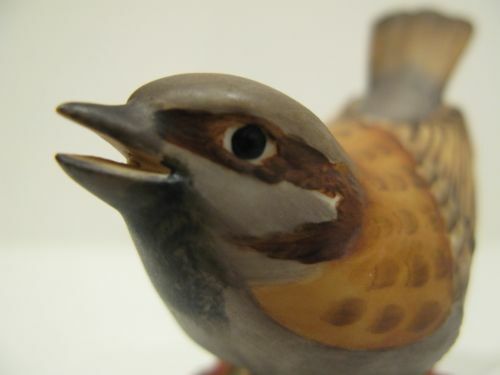 A Royal Worcester "Sparrow" Figurine By E. Soper. 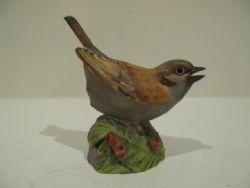 A small, Royal Worcester porcelain figurine titled "Sparrow" modelled by Eva Soper. 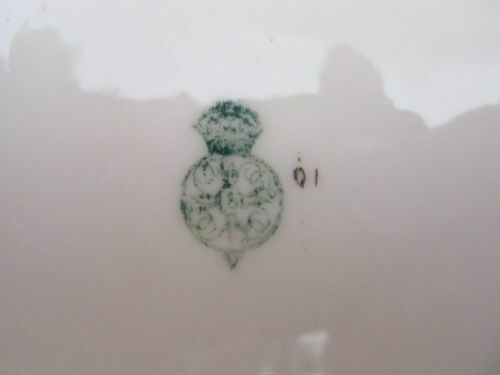 Standing approximately 3.1/4"tall x 3"wide, it has the black factory stamp for circa 1965 and is in excellent condition with no damage, chips or restoration and the painting is bright and without wear. A Royal Worcester "Stork" Painted Ewer By W. Powell Dated 1911. 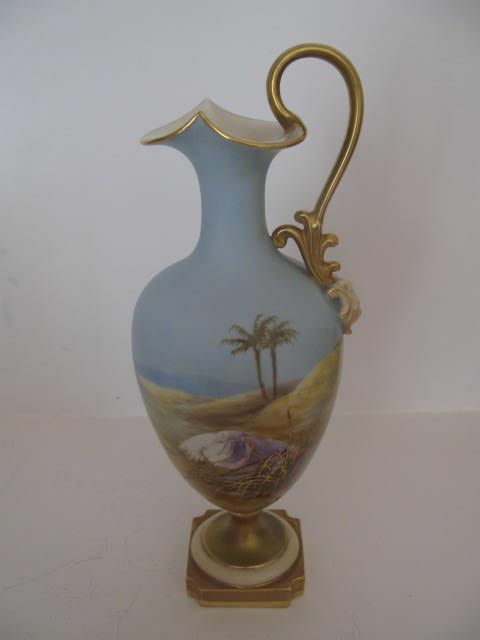 A very attractive Royal Worcester porcelain ewer, shape number 1944, with a well painted all around scene by the specialist painter Walter Powell of a stork wading at a palm tree fringed oasis, surrounded by barren desert mountains. 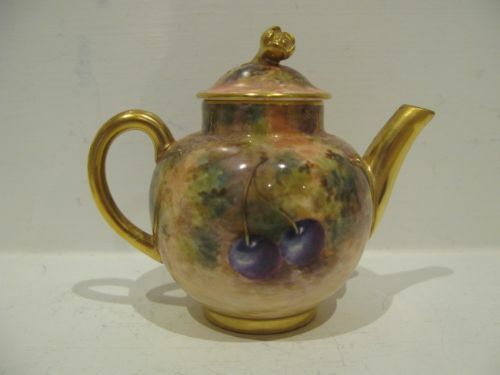 Standing approximately 9.1/2"tall x 3.1/2"maximum width, it has the puce factory stamp for 1911 and is in excellent condition with no damage, crazing or restoration and the gilding is bright and shows virtually no wear.